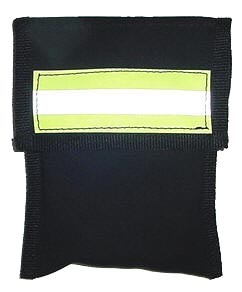 Made of Heavy Army Duck, the 9 x 5.5 search pouch has a 6 inch Velcro belt loop on back allowing it to attach it to any SCBA harness or belt. The Web Pouch contains 24' of Sterling one inch tubular webbing with 8 inch handles on each end. This will allow you to tie off to fixed points for use as a search line, drag a victim to safety, or use as a multi purpose utility line.